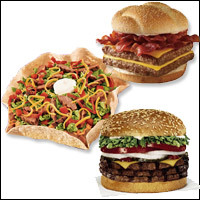 The Big Fast-Food Survival Guide! Let's keep this fast and get right to it -- read this info! 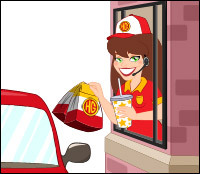 HG's TOP ATE Tips for Fast-Food Trips! 1. Think before you order. You'd Google a blind date, right? Google your meal for need-to-know stats! 3. Salad isn't always the best pick. The dressing, the cheese, the croutons... Don't assume the greens make it "safe." 4. The fries? They have more calories than you think. Even a super-measly small order averages 300 calories and 14g fat. If you're putting together a low-calorie meal, they should not be included. 5. LOOK OUT for mayo! Seriously, heavy mayo can sink even the most friendly grilled chicken sandwich. And it isn't always listed, so say, "Hold the mayo," just in case! 6. Beware of the limited-time-only offers. The nutritional stats are often MIA. (How convenient.) That special super-stacked burger? It's not worth it. 8. Don't stress too much or feel bad if your meal isn't as low in calories as you'd like. Hey, stopping for fast food is hard to avoid sometimes! Just do the best you can. This is listed with the desserts on the menu, but we consider it a great breakfast, side dish, OR dessert. Also lumped in with the sweets, but good anytime? The Apple Dippers with Low Fat Caramel Dip! 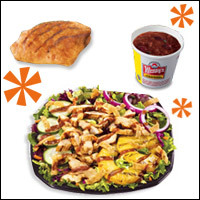 Want to enjoy a whole meal from TB without swallowing too much fat? Get two of these with a side of Fresco-style Pintos. Your filling meal will come in at about 490 calories, 19g fat, 10g fiber, and a SmartPoints® value of 15*. Not too shabby! "Hungry Girl! I require a hamburger!" Not a problem; this pick is totally acceptable. Add a crouton-topped side salad without dressing for 120 calories! Answers to Burning Fast-Food Questions! Q: If Hungry Girl were at a fast-food restaurant, what would she order? A: A grilled chicken sandwich without condiments or a bun OR a grilled chicken salad without croutons or cheese (preferably from Burger King). Q: How can I make guilt-free swaps for fast food at home? 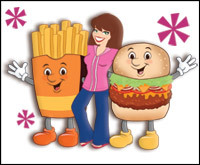 A: Click here for a SLEW of recipes for slimmed-down junk food, including a massive section of fast-food makeovers! Q: Why are those drive-thru speakers always so hard to understand? Look at all this info! You can't keep this to yourself -- click "Send to a Friend"!